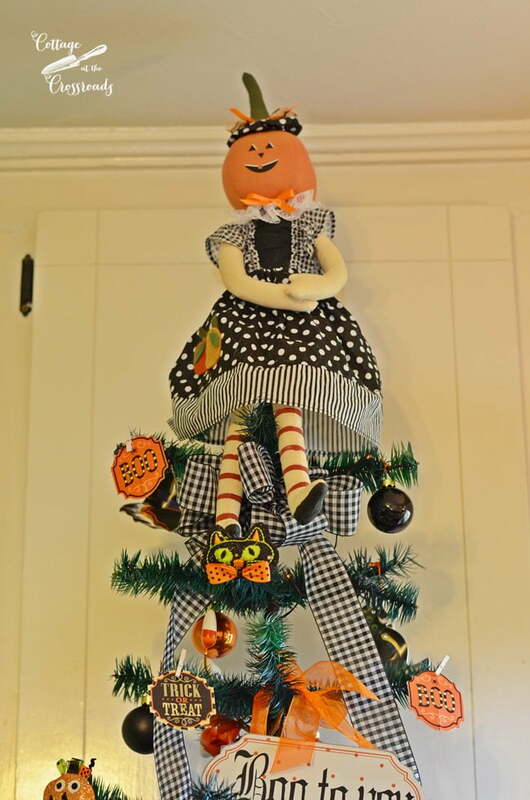 A few days ago, I put together this fun little Halloween tree for our kitchen. It’s sitting on a ledge that’s next to the windows. This ledge is the perfect place to put seasonal displays in our kitchen. I really hadn’t planned on making a Halloween tree this year, but my friend Brenda was cleaning out some of her things and she asked me if I wanted a little scrappy tree. Well, yes. 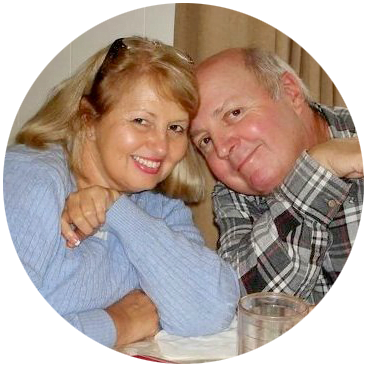 I love scrappy and free! 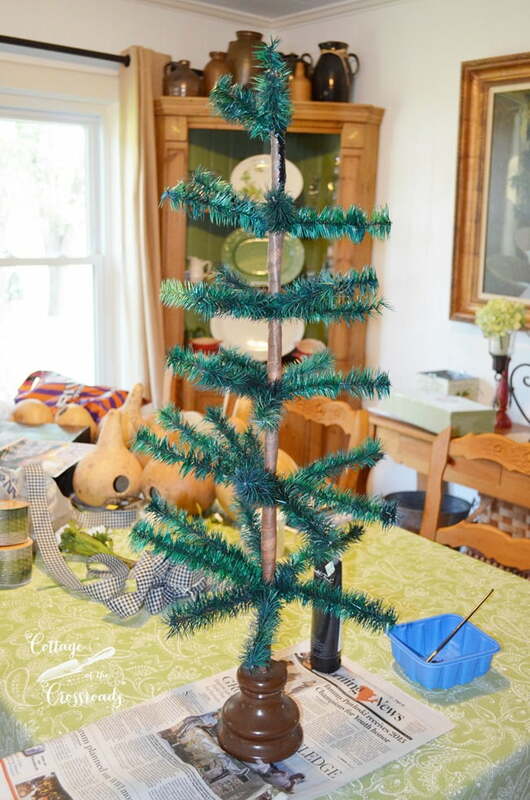 Once it occurred to me that I could create a Halloween tree, my first thought was to spray paint the entire tree black. But then I got to thinking that I might want to use this tree to decorate for other seasons, so I just painted the trunk black and the wooden base orange. 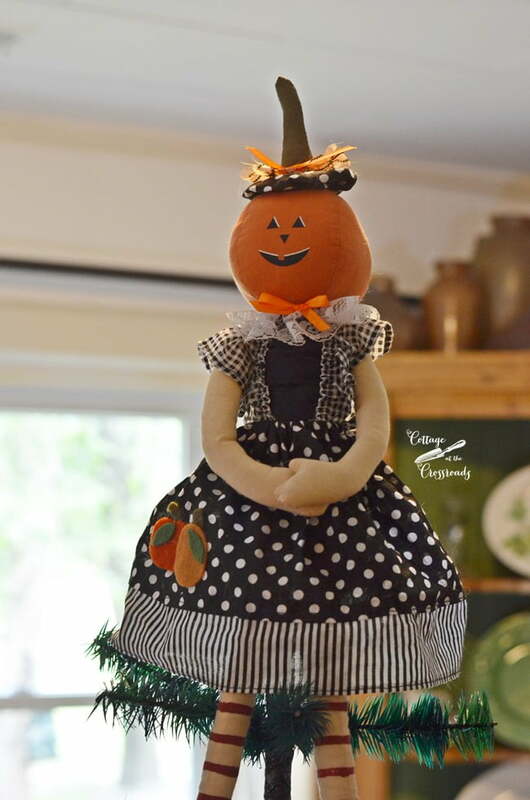 I already had this kitchen witch that I used to decorate the kitchen for fall a few years ago. I knew she’d be cute perched on top of the tree. 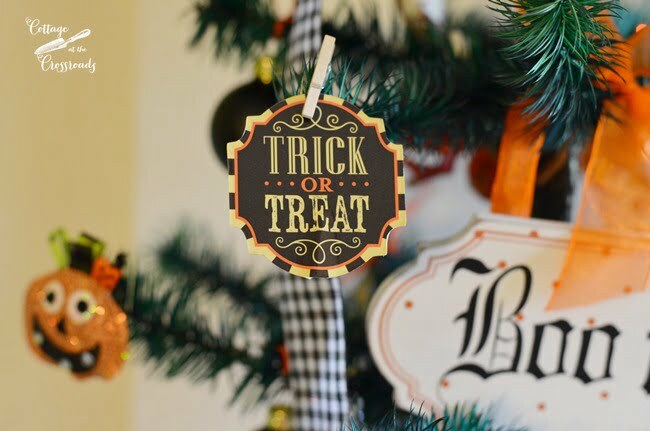 But I needed a few more decorations so I made a trip to Hobby Lobby and picked up some black and orange ornaments and a few other things. 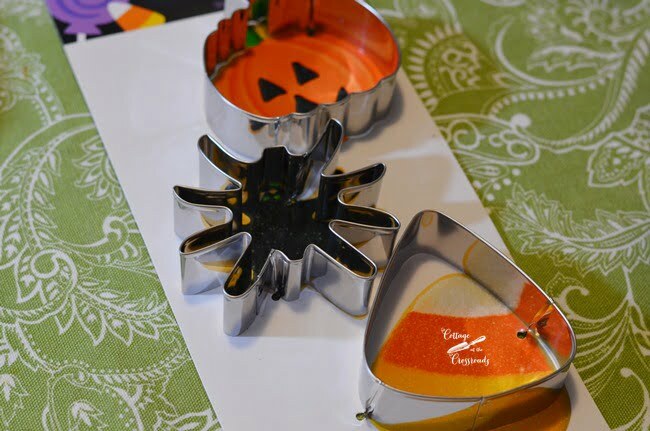 Since the tree was going into the kitchen, I picked up a few cookie cutters which had some Halloween designs printed on the card that the cutters were attached. So I cut out the designs and hot-glued them to the back of the cookie cutters. 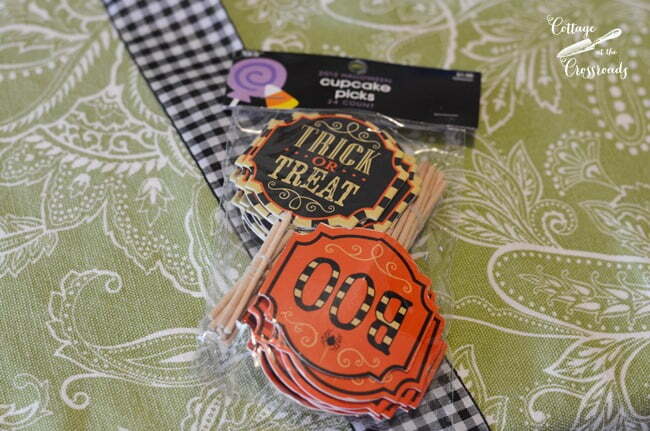 I thought these cupcake picks would provide me with quite a few inexpensive ornaments so I removed the pick and clipped them onto the tree with some mini-clothespins. 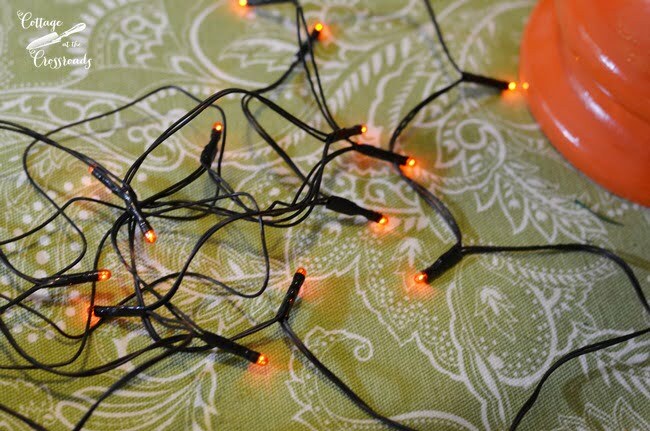 And, of course, the tree needed some lights so I ordered this little set of battery operated lights from Amazon. 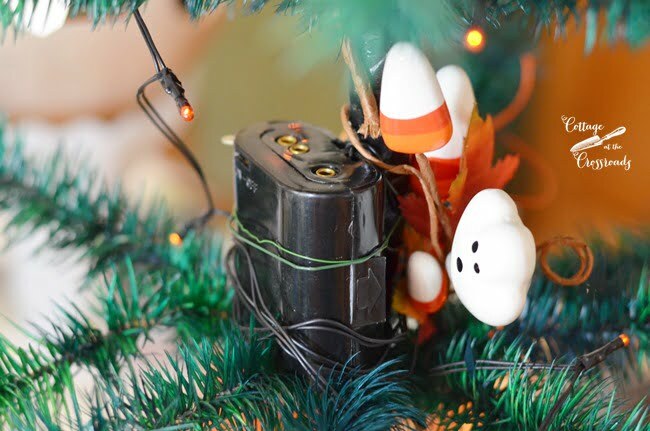 I wired the battery pack onto the tree with some floral wire making sure I could access the switch to turn it on and off easily. These little ornaments are actually hair barrettes that came in a pack. After getting the decorations in place, I hung this little sign onto the tree. Gosh darn! The whole tree was so easy to put together and sure brings a smile to my face. There’s still quite a bit of the kid in me! 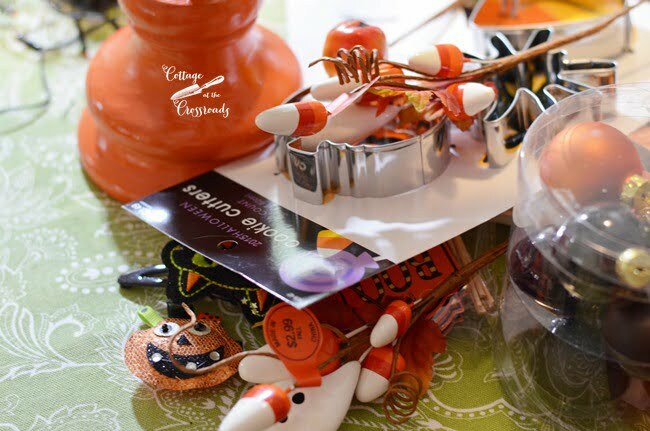 It brings back wonderful childhood memories of trick-or-treating. 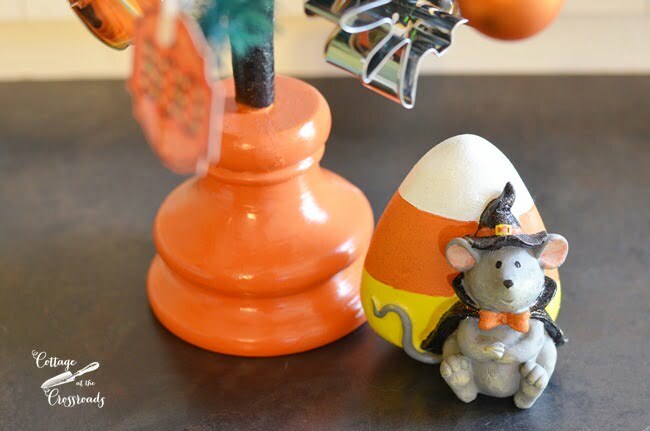 I placed this little mouse who’s dressed in his costume next to the base of the tree. 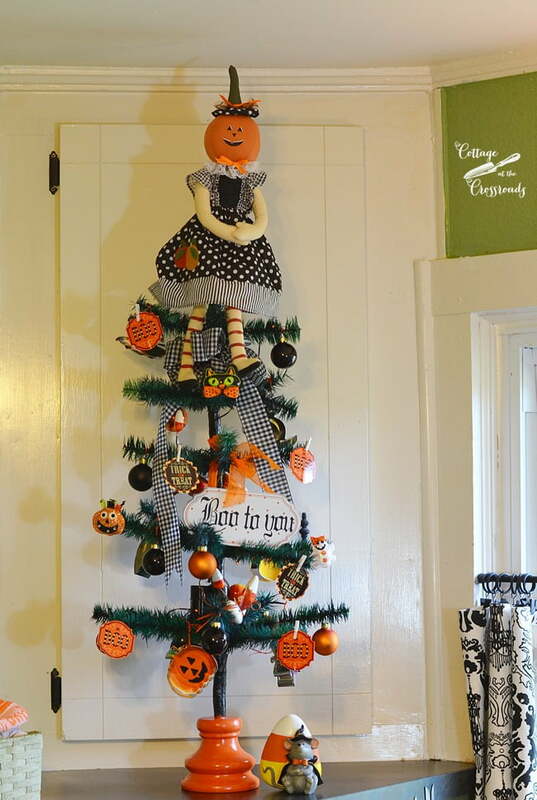 Such a fun and cute Halloween tree for our kitchen! Brenda, how do you like your scrappy tree now? I’ll be back soon to show you the rest of the kitchen. How can I NOT decorate the rest of it when this cute tree is sitting in the corner? Great job! The tree is adorable and perfect for the kitchen. Thanks for sharing the details. Jane, sooo adorable! A comment was just left that struck a note!????. It’s tree /bush pick up in our neighborhood……I’ve already snagged a few evergreen branches for a front door decoration,???? but this has TREMENDOUS possibilities. !!!! Thanks for posting and thx to the other comments left! ???? 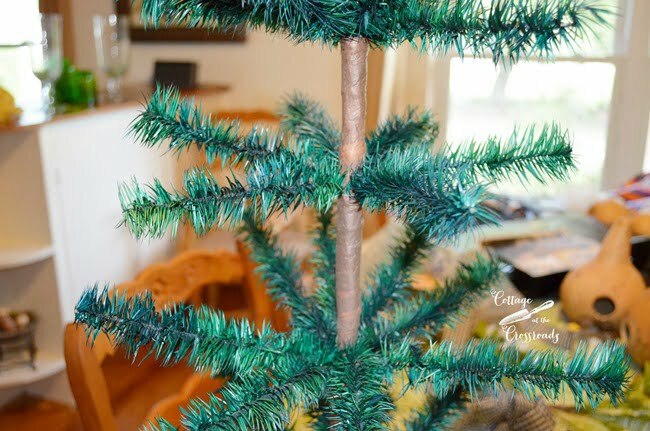 Your little tree is a feather tree…hard to find AND pricy, so you truly lucked out with your friend’s giveaway! Love how you decorated it and totally agree that the kitchen is often the best place to add some fun elements since we spend so much time in there! (I now seasonally decorate the window sill over my sink since I’m standing in the area so often either at the sink or doing prep on one side and cooking on the other). I plucked a branch from the yard when I was walking the dog yesterday and I’m going to do a ‘spooktacular” tree based on your model! Thanks so much for sharing. Greetings from the Northeast. So, adorable! You did a great job! Love your pumpkin girl! 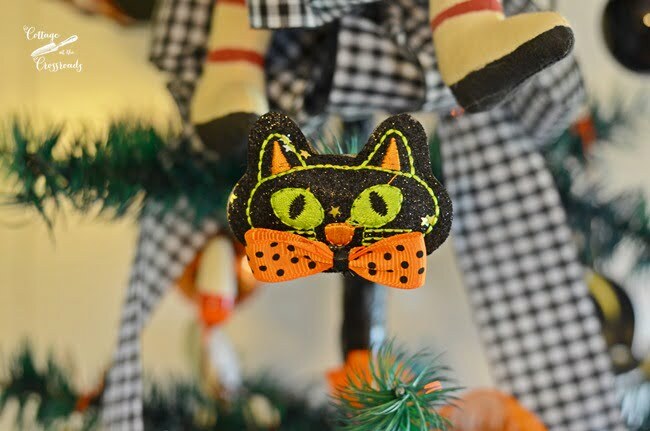 Your Halloween tree is adorable! 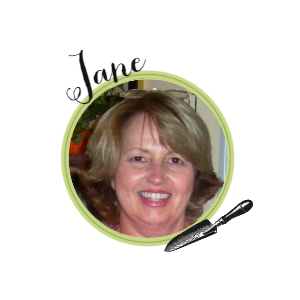 Oh Jane! That is too cute!!! Jane , love your tree and particularly the pumpkin girl I saw last yr. on your scale. Looked for a pattern to make one but couldn’t find any. I’m not into Halloween but I do love her .Have a great fall season. Have to ask; do you really have your logo painted on the walls and did you paint it? Jane that tree is so so cute!!!!! I would to have one in my kitchen! Sandee Fairfax Va.
Really cute! I bet Brenda will want her tree back now! Oh Jane this is just SUPER cute!!! How fun and creative. That tree is absolutely beautiful. Now I am on the lookout for a similar tree. Sweet little tree Jane, Bet that brings a smile to visiting faces. Adorable! 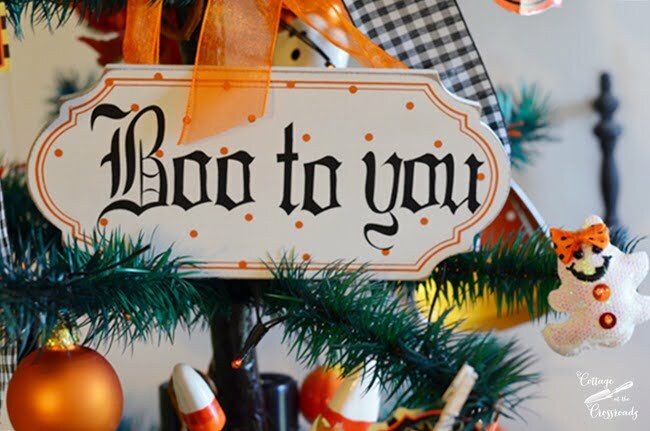 I’m not much one for decorating for Halloween (I have no young kids, no grandkids) but this is soooo cute! 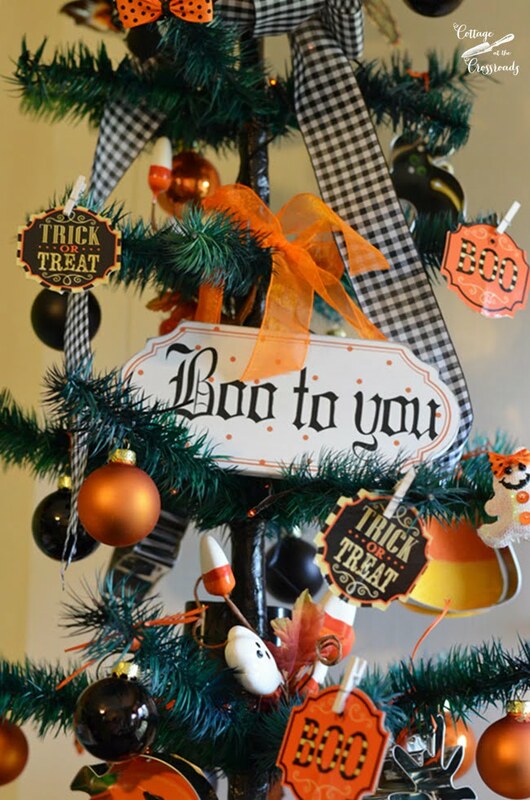 Oh my gosh I love your Halloween tree Jane…so cute! !